Grant County was one of the last places to be settled in Washington State. The first visitors grazed livestock on the rich bunch grasses, sharing space with the Wanapum and Sinkiuse tribes. Homesteaders planted wheat, hay, and orchards, and marketed fish around Moses Lake. After unusually wet years, weather patterns returned to normal and the area creeks dried up, forcing many families to move away. Not long after, the Great Depression bankrupted many of those who had not been ruined by the droughts. It wasn't until World War II, when military bases were built in Ephrata and Moses Lake, that people started to return to Grant County. The completion of Grand Coulee Dam in 1942 and of Priest Rapids Dam and Wanapum Dam in the 1960s brought cheap electrical power and irrigation, which lured farmers, ranchers, and orchardists back to the county. 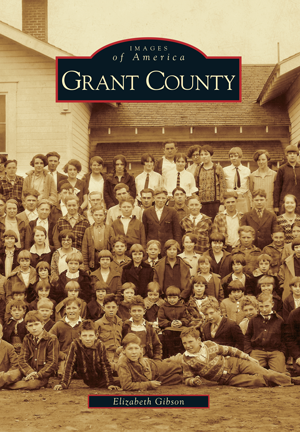 Elizabeth Gibson shares the story of Grant County in this, her fourth book in the Images of America series. Showcased in this volume are rare images from the Grant County Historical Society, Moses Lake Museum and Art Center, Quincy Valley Historical Society, Washington State Potato Commission, and Port of Moses Lake, as well as many never before published photographs from local residents who generously shared their personal collections.